In the movies when an actor delivers that line the scene invariably consists of the other actor to whom the question was asked, proceeding to the bathroom and closing the door and you don't get to see what they freshen. In all my television and movie watching days, the cameras have never taken me into the bathroom with that person. In one of our books, my sister and I wrote about being guests at a woman’s home in Hollywood. She had a lovely, movie star type home and we were going to stay overnight. She said when we walked into her luxurious living room with our luggage in tow, “Would you like to freshen up?” “Yes,” we said, in unison, as she led us to her guest room with a bathroom. As soon as the door was closed, we looked at each other and one of us said, “What does freshen up really mean?” Should we take showers and do a really fresh start? Should we wash our armpits and put on deodorant or just put some more on over the old? Should we brush our teeth? Our hair? We decided in that moment to consider washing our hands as the action one does to freshen up. We decided to take about five minutes (that’s how long Mom took every night before Dad came home from work). She’d say, “Oh girls, Dad’ll be home pretty soon, I’m going to freshen up!” and she’d shut the bathroom door and once again we didn’t get to see what she did in there, but she’d come out FRESH. We both agreed we had “travel hands.” Our definition of travel hands is the same as for shopping hands only with distance added. It’s hands that have been busy outside the home where they can collect foreign substances our systems aren’t familiar with. They don’t have familiar stuff to wash off like kid related materials ie: vomit, snot, poop, peanut butter, jam and such. Travel hands have more subtle, maybe even microscopic elements to take care of. So we took five minutes to wash our hands, sort of like how a surgeon would wash her hands before going into surgery. When we were through, we both looked at the beautiful monogrammed hand towels displayed on the counter and we couldn’t bring ourselves to use them so we wiped on the rug and went out acting very fresh. On the subject of freshening up, here are some tips to consider in freshening up your home during this winter season that can seem dreary and dull. 1. There are several ways to use framed photographs to freshen up your décor. 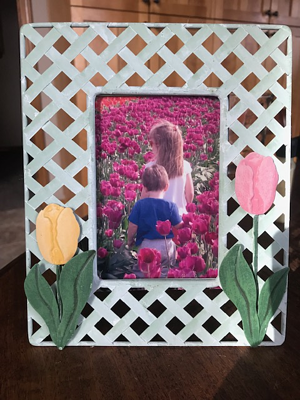 In the winter you can put out springy frames and photographs. 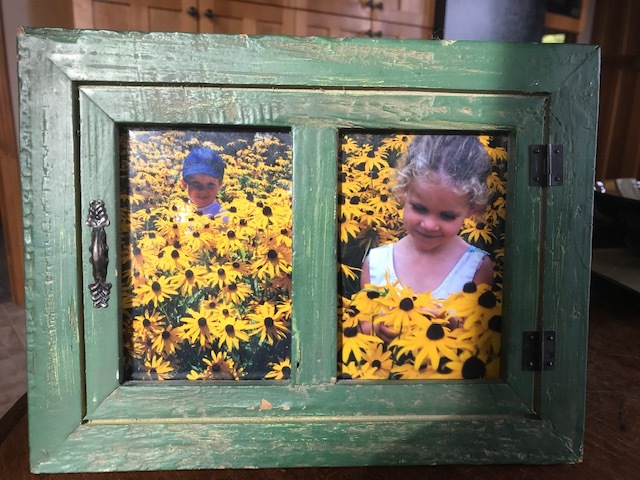 You can also rotate your favorite photos in your picture frames. 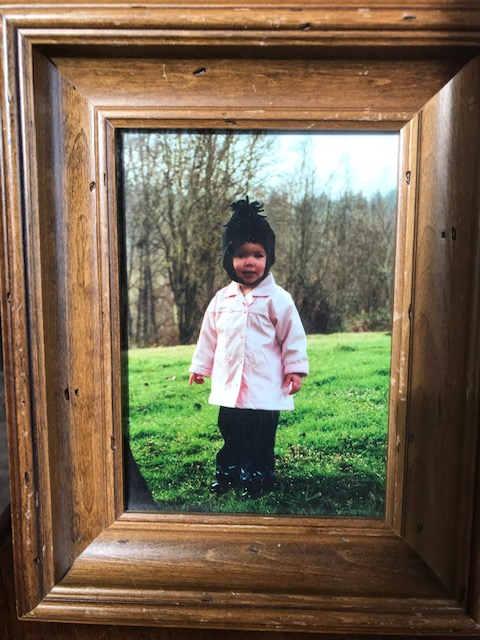 I like to have photos that correspond with the season, so now I have a winter photo in this frame. and behind this photo I keep the seasonal choices for when a season changes. 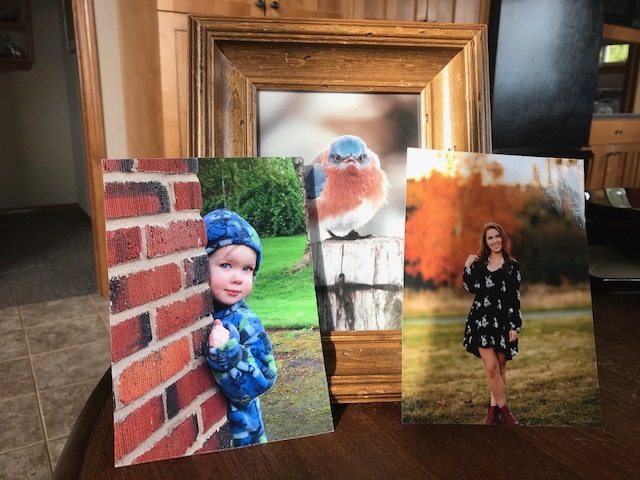 As you can see below, I have a summer blue bird, my granddaughter Brooklyn in the spring and a grown up photo of her in the fall all behind the photo of her in the winter. 2. Move your furniture around and give a fresh look to any room. This is the most inexpensive way to make a new look. I love to move furniture around and when we get the Christmas tree out it's a great time to move everything. 3. Perk up your kitchen with new dishcloths, hand towels and oven mitts. 4. Purchase a few potted plants in bloom that can be planted outside in the spring. 5. Purchase new dishes. 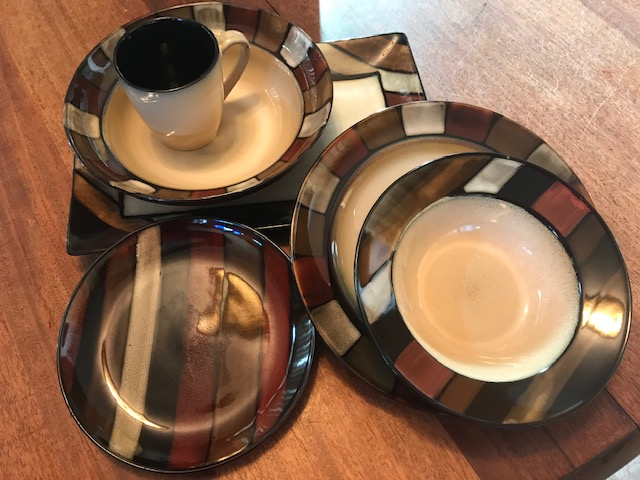 I love to go to estate sales and recently I found dishware at an outrageously low price. I paid $20 for this set of “NEW to me” dishware (and some of the pieces still had sticker prices on them. One serving piece had a sticker price of $49.95 and there were three of those pieces with the set! My guess is the whole set sold retail would have been around $600. Having new dishes will perk up your everyday eating experience (and for me serving experience). Secondhand stores are an excellent place to find dishes. 6. When it comes to those items the public never sees, it’s easy to overlook the wear on such things. Look at your linens with fresh eyes (put on your Goodwill Glasses; pretend glasses you wear when looking at stuff at Goodwill with focus and judgement) and while you’re at it, use those glasses on your underwear, bathrobe, towels and washcloths. I like having white linens, towels and washcloths, because I can bleach and disinfect them and they stay fresh and clean looking longer. 7. Get a new haircut look. Ask your hairdresser what she or he would do with your hair if you had no opinion. It’s amazing when you defer to a professional in his/her field. They can look at your head objectively and you may go out the door happy with a new look. Just remember...it'll grow out. This time of year is the greatest time to get organized and de-clutter. The Sidetracked Home Executives 3x5 card file system and the Slob Sister's De-junking video will get you on the road to a fresh, organized life. It's information is timeless and the cost is so reasonable for a life-changing system.